Rabbi Isaac Luria (1534-1572) is among the most influential, and remarkable, Kabbalists of all time. Called the Ari, or Holy Lion (the name is an acronym for Elohi Rabbi Isaac, or the Godly Rabbi Isaac), he is most associated with the renaissance of Kabbalah that occurred in Tsfat, a small town in northern Israel that is to this day a center of Jewish mysticism. Yet the Ari only lived in Tsfat for two years, and most of his teachings are only known through the writings of his disciples. He was a remarkable figure, regarded as an almost angelic being by his contemporaries, and universally acknowledged as a genius both of Kabbalah and of non-mystical Judaism. Luria was born in Jerusalem, but raised in Egypt. Recognized early on as an adept at Jewish law, he spent several years studying Talmud. In his early twenties, however, he moved to a secluded island on the Nile to focus on the study of Kabbalah, particularly the Zohar. Little is known of this time in Luria’s life. He would visit his wife and family only on Shabbat, and speak to them only in Hebrew. He believed himself to be in conversation with Elijah the prophet, and with deceased teachers of the Kabbalah. During one such conversation, Elijah told him to move to Israel and study with Rabbi Moses Cordovero. Luria did so in 1569. 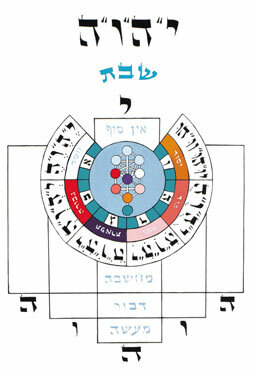 Lurianic Kabbalah (Kabbalat HaAri) is, in large part, an elaboration of certain themes from the later portions of the Zohar. Yet it so expounds upon those themes that it is generally regarded, by scholars and Kabbalists alike, as its own branch of the Kabbalah. Today its most well-known doctrine is that of the creation of the world, which is seen as unfolding in a three-part process of Tzimtzum, the withdrawal of the Infinite to “make space” for the finite; Shevirah, the “breaking of the vessels” into which the Infinite light was poured; and Tikkun, the ongoing repair of those vessels. This doctrine is highly mythical; it is a narrative, not a theory. Yet it is also extremely complex, filled with mystical speculation on how the tzimtzum occurred, what the flaws of the “vessels” were, and a myriad of other details. Yet for all the mythic aspects of the theory, it can be seen as explaining a very basic aspect of life: that even though God fills the universe, the world often appears to be broken. It is easy to draw a connection between the focus on the world’s brokenness and the breakage of the Kabbalists’ own world, in the wake of the Spanish Expulsion. Following Gershom Scholem, many scholars have suggested exactly such a link. Yet the actual historical situation was quite nuanced, and the Kabbalistic literature itself seems more occupied with cosmic exile, breakage, and return than with their reflections on the worldly plane. Still, these ideas resonate today with those who see the Holocaust in a similar light, and who draw inspiration from the great work of Tikkun Olam, or repairing the world. For the Ari and his associates, Tikkun Olam is effectuated by the mitzvot, and by specific intentions accompanying them. Today, however, the word is often used to denote acts of righteousness and lovingkindness. And while Tikkun Olam is a 16th century innovation, it is sometimes described as the primary purpose of Jewish life: repairing the world. In this process, the precise intentions, or kavvanot, are essential. Many Jews are familiar with the word kavvanah, which means intention — to pray with kavvanah is to pray like you mean it, with focus and intention. Kavvanot are a bit more complicated; they are specific intentions, not general ones; they are like a cosmic technology. Every mitzvah has a mystical meaning, in its precise detail. And every prayer corresponds to a different aspect of the Divine. Learning all of these details, and performing commandments with the right intention — this is the task of the Kabbalist, and the way to bring about redemption. There’s a wonderful Hasidic teaching that the Ari provided all the keys to all of the locks in heaven — but today, having lost the keys, we are trying to break down the door. That’s the difference between Lurianic Kabbalah and Hasidism in a nutshell: the former provides the right keys for a thousand different locks, and the latter uses emotional force instead of calibrated mental intention. Just as scholars have linked Lurianic Kabbalah’s doctrine to the recent past of the Spanish Expulsion, so they have also connected them to the fervent messianism of the 16th and 17th centuries, which culminated in the mass movement of Sabbetai Tzvi, a messianic figure who at the height of his popularity had over one third of the European Jewish community as his followers. As before, there is truth to these theories, though the situation is more complex than it may at first appear. Clearly, the Ari and his followers saw themselves as bringing about redemption — the Ari himself was seen as a proto-messianic figure, and his chief disciple, Rabbi Hayim Vital, saw himself that way as well. And Sabbetai Tzvi’s primary advocate, Rabbi Nathan of Gaza, used Lurianic ideas to justify the new messiah. But there were many other factors as well, not least the tremendous upheavals and massacres of the 17th century, which, far more than the Kabbalistic theories of the elites, were a mass phenomenon. To draw a more recent parallel, the Kabbalah of Rav Kook clearly played a part in the creation of religious Zionism — but the Holocaust probably mattered more, and to more people. Kabbalat HaAri is today among the most complicated and inaccessible branches of the Kabbalah. Very little of the literature has been translated into English, and it is often so ornate that, even with adequate background in the Zohar, it is difficult to comprehend. Hayim Vital’s Etz Hayim is probably the most widely accepted systematization of Lurianic Kabbalah, and translations of Lurianic literature are currently underway. (The popular anthology of “Safedian Kabbalah” primarily contains ascetic and pietistic practices, which were central to the movement but peripheral to its theological ideas. Lawrence Fine’s “Physician of the Soul” is an excellent portrait of the Ari and his circle.) One teacher of mine remarked that he set out, early in life, to learn Sabbatean Kabbalah. But he realized that to do so, he would have to understand Kabbalat HaAri. And then he realized that to learn Kabbalat HaAri, he really had to understand the Zohar first. So, twenty years on, he is still learning the Zohar. For all its abstruse detail, however, there is no denying that Lurianic Kabbalah has created some of the most familiar Kabbalistic ideas and practices, not least Tikkun Olam and Kabbalat Shabbat. And it was Isaac Luria, a genius turned hermit turned saint, who catalyzed this new phase of the Kabbalah’s history. His grave in Tsfat is now a place of pilgrimage, where candles burn through the night.